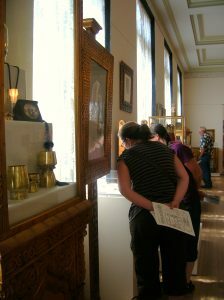 Wow your group with a trip to Maryhill Museum of Art. Discover fascinating art, regional history and world class exhibitions, and an unparalleled scenic location. $10 per person for groups of 10 or more (advance reservations required). Special group-priced Maryhill Brown Bag lunches from Loïe’s: The Museum Café are available to tour groups of 10 or more with advance reservation. Tour companies bringing 5 or more groups a year are eligible for special admission rates and discounts. For more information, contact the museum at 509 773-3733 ext. 33 or email visiting@maryhillmuseum.org. College or university classes enjoy a group rate of $9 per person. For more information contact education@maryhillmuseum.org or call the education office at 509 773-3733 ext. 25. Short greeting for your group, focused on Maryhill’s fascinating origins (available on request). Free Visitor Guide for each person. Free admission for tour guides and bus drivers. Free parking and a handicap accessible drop-off area. We can also offer a wine and cheese reception or other forms of hospitality for your group (must be arranged in advance). A visit to Maryhill Museum of Art can easily include excursions to nearby attractions, including Stonehenge Memorial, a full-scale replica of England’s famed Stonehenge. Native American pictographs and petroglyphs can be toured at Columbia Hills State Park, with numerous art galleries, museums, wineries, restaurants, and hotels in the vicinity. Be sure visit the Special Exhibitions and Event Calendar pages to learn what else is happening at the museum. Please call (509) 773-3733 ext. 33 between 8:30 a.m. – 5:00 p.m. Wednesday – Sunday, or leave a message. You may also email visiting@maryhillmuseum.org with your questions. Click here for a PDF of our Group Tours flyer.